Increasing autonomy means our cars will learn to make life-saving decisions in split seconds. 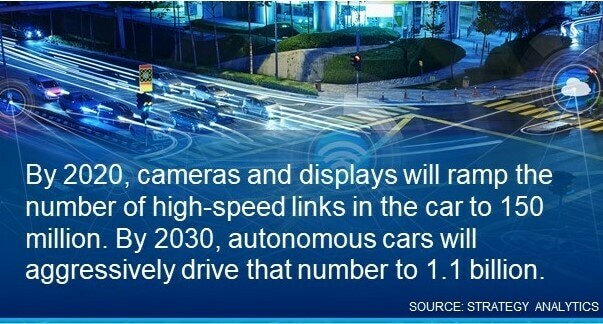 Sensors will capture and send an enormous amount of data to precisely map the car’s surroundings. Handling that data alone requires gigabit data speeds. When you add ever-increasing infotainment and emerging monetization opportunities, the speed required jumps to multi-gigabit levels. Traditional vehicle network protocols, including Lin, and CAN, operate on lower bandwidth speeds that are designed for simpler tasks such as body control in high-volume models. 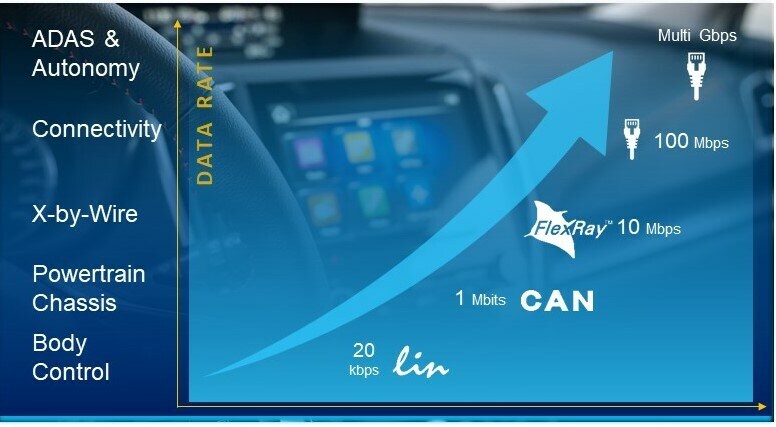 Even FlexRay, currently the fastest at 10 megabytes per second, is significantly slower than the multi-gigabyte speed required for more deterministic tasks in autonomous cars. Automotive Ethernet offers a leap in bandwidth — gigabits-per-second speeds — to handle enormous amounts of data. Compared to common and established IT enterprise “blue” cable, automotive-grade Ethernet has its own requirements. Compact cable weighs less for higher efficiency. The lighter the car, the more efficient it is. The rising number of electronics in every car adds more network cable, which adds to the weight of the car. Automotive Ethernet is compact, made of light-weight single Unshielded Twisted Pair (UTP) cable that can run multiple electronics applications over a single cable. Auto-grade also means that it meets the temperature requirements. Switches help handle the task of data routing when automotive Ethernet is used for the backbone of the vehicle’s distributed network. This leads to lower weight and cost than the alternative dedicated cables. High speed network supports bidirectional, real-time communications. Whether you’re downloading a critical safety update from the cloud, passing messages from the brakes to the fusion box, or streaming movies from Netflix, automotive Ethernet scales. Data can be prioritized based on type. Safety alert systems, for example, can be prioritized over streaming infotainment. NXP auto Ethernet high-bandwidth capability expands to multi-gigabit speeds. Ethernet solutions must be automotive grade and a size and weight that make implementation feasible. This led us to expand NXP’s rich in-vehicle networking portfolio. We recently acquired OmniPHY, a pioneer in high-speed automotive Ethernet IP and automotive qualified IP for 100BASE-T1 and 1000BASE-T1 standards. OmniPHY interface IP and communication technology along with NXP’s automotive portfolio will form a “one-stop shop” for automotive Ethernet. The companies’ technology synergies will center on 1.25-28Gbps PHY designs and 100- and 1000BASE-T1 Ethernet in advanced processes. In this video, I explain more about our vision. Automotive Ethernet will not only connect the vehicle’s electronics systems, but will connect the vehicle with other vehicles and even make the car a productive part of the IoT. It supports the high bandwidth and real-time processing required for today’s infotainment and advanced safety systems and provides a platform for the development tomorrow’s truly autonomous driving.